Everything about tech has changed. Isn't it time your Cloud Storage caught up? Not only organize but also protect your data with military-grade encryption using BigMIND Home Cloud Storage Solutions. Own this cloud storage with affordable prices & amazing functionality now available in 100GB, 500GB & 1TB. Buy Now! Reinvent Personal Cloud with the smartest, intelligent and instant cloud storage solutions. BigMIND is a complete solution that meets all of its user’s needs through a secure, flexible, and smart system. Automatic Backup: Back up your files from any data source, all from one location with no backup limitations. Compression: Uses on-the-fly decryption to reduce bandwidth consumption. Compliances: BigMIND is built entirely on Amazon Web Services (AWS), the world leader in cloud computing. Why Choose BigMIND Home Cloud Storage Solutions? A growing pain nowadays is having masses of unstructured data scattered across desktops, laptops and mobile devices. With no time and inadequate security measures to protect these valuable data assets, we found out a solution that can not only organize your data but protect it with military-grade encryption. But that’s not all. BigMIND is made with you in mind. You don’t need any technical skill or even an IT degree. Just upload your data and the technology will do the rest, allowing you to focus on what really matters. If you do require any assistance, our dedicated support can answer any questions you may have. The amount of video content being generated is increasing every year. BigMIND understands this, which is why its advanced technology allows you to stream any video or audio without any buffering. BigMIND supports 100s of media formats including HD, 4K, 3D, WAV and mp3. BigMIND intelligently analyses any image uploaded to the platform, helping you to save time and effort by searching camera type, resolution, location, date taken, dominant color and more. You can also add your own data tags to organize your photos. The top priority is to save you money, whilst keeping your valuable data assets safe, secure and accessible. You’ll only need pay for the on-demand secure storage you need. BigMIND ensures 99.9% uptime of cloud services. This means data transfers won’t be interrupted and the chances of downtime are extremely slim. Each user can have up to three (3) active backups from three different computers at a time. Future updates for the BigMIND desktop application are free. Supports both 32-bit and 64-bit platforms. Requirements for Windows machines: At least 512MB of RAM / Intel. Pentium® 4 processor or above, AMD Athlon™ 64 / 200 MB of free hard drive space. Requirements for Mac machines: At least 2GB of memory / At least 150MB of available storage. Supported Operating Systems: Windows 7 at least SP1, Windows 8, Windows 8.1, Windows 10. Standard and Premium technical support provided. 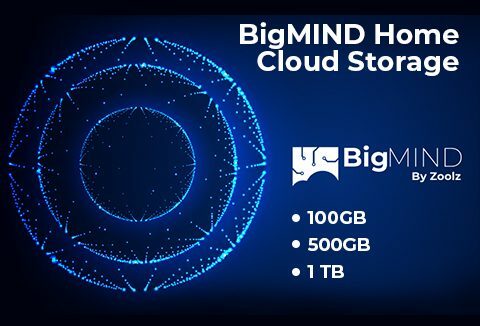 Manage your Big DATA with BigMIND Home Cloud Storage Solutions. At A Deal Price Starting From $17.94 Only!